Lorain County Public Health monitors tick activity to help keep them from spreading disease. Ticks can spread diseases like Lyme disease and Rocky Mountain spotted fever. If you find a tick on yourself, your child, or pet, please contact LCPH at 440-322-6367 for identification. Ticks look like spiders. They range in size from a grain of sand to an apple seed. They live in moist, shaded woods, low-growing brush, dense weeds/grasses, or piles of leaves or wood. 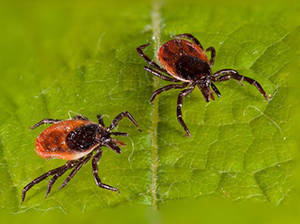 Ticks can be found throughout the spring, summer and even into the fall. They are most active in June and July. Ticks do not jump or fly. They crawl onto humans and animals when we brush against a leaf or blade of grass with a tick on it. They look for a place to attach, like the backs of knees, armpits, hair or behind the ears. A tick bite does not hurt, so you might not notice it. Stay out of weedy, tall-grass areas. Walk in the center of trails to avoid contact. Wear light-colored clothing. Wear long-sleeved shirts, long pants, a hat and shoes or boots. Tuck pants into socks or boots. Use chemical repellent with DEET or Permethrin. Follow the directions on the label. Children should not put repellents on themselves. Wash clothing that has been sprayed with repellent after use. Check your entire body for ticks after being outdoors. Check children at least twice a day, especially the head and neck. Look for a freckle that moves. Ticks can be very small. Check clothing for crawling ticks. Putting clothes into a dryer on high heat will kill ticks. Keep dogs tied or penned in a mowed area. They can carry ticks into the home or yard. Check them daily.